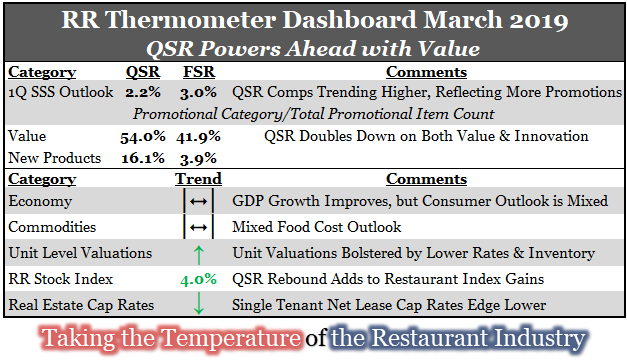 1Q comp outlook is trending higher, reflecting an up-tick in QSR. 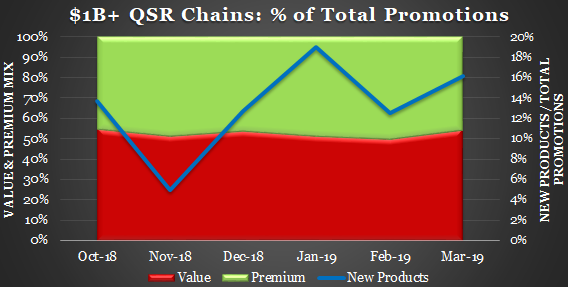 This reflects a ramp-up in QSR value promotions while FSR offers fewer deals. This is evident of the industry's see-sawing between traffic driving initiatives and margin preservation. 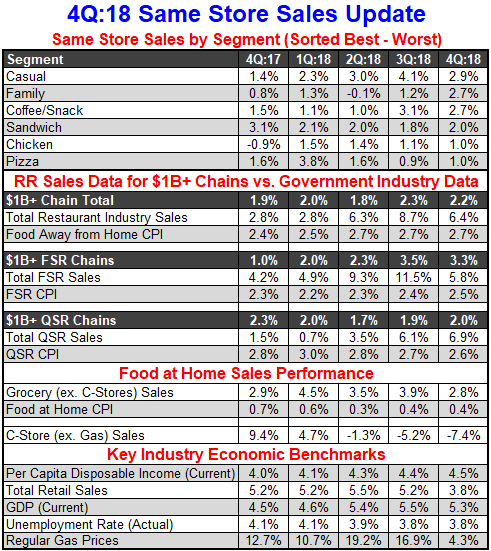 Retail sales for restaurants reinforces the trend of improving QSR and slowing FSR. 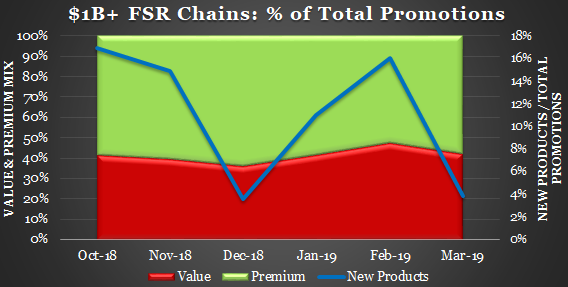 QSR value promotional mix jumped +420 bps to 54% after several months of decline with more price specific offers across almost ever category. Innovation also increased +350 bps to a 16.1% promotional mix driven by the sandwich segment and Papa John's. ​Conversely, FSR value mix declined -540 bps m/m to 41.9%. 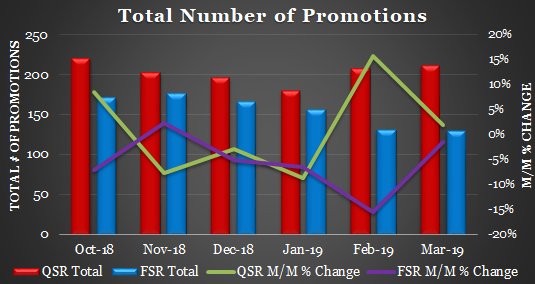 FSR innovation was also very weak with only 3.9% of promotions featuring new menu items (2nd lowest in 27 months). 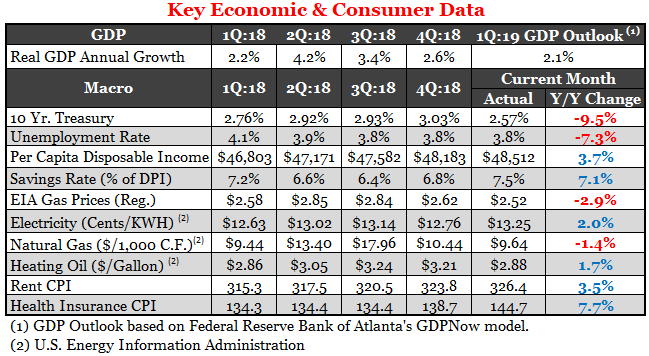 1Q:19 GDP growth outlook improved to +2.1% from +0.3% last month while expectations for personal consumption expenditures growth is relatively flat (+0.6%). Pros: low gas prices (although starting to creep-up due to a recent rise in oil prices); and m/m decline in interest rates (FED becoming more accommodating) which has helped drive down the 30-year fixed rate mortgage from 4.8% in Nov. 2018 to ~4.2% as of 4/2. Cons: Slowing disposable income (+3.7% in Feb. and +3.8% in Jan. vs. +5.3% in Dec.) and higher health insurance costs (CPI +7.7% in Feb. and +6.5% in Jan.). 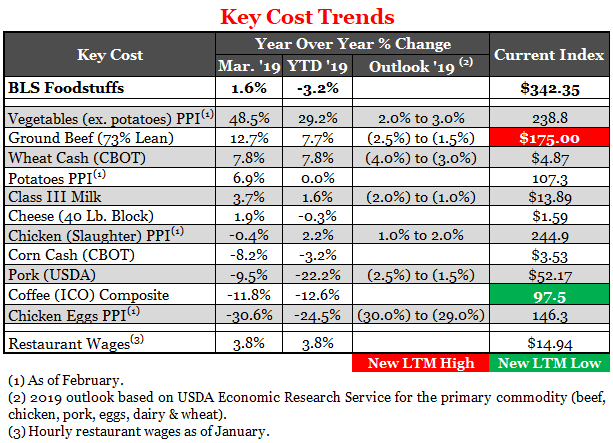 The BLS Foodstuffs Index edged higher for the first time in 6 months on a y/y basis and the 2019 USDA outlook was mixed with chicken and beef prices revised upward but vegetables, pork and milk revised lower. 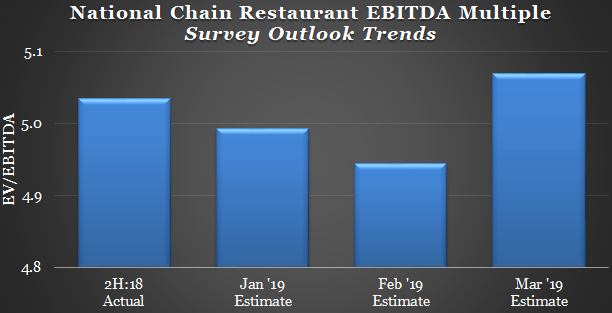 Franchisee EBITDA valuations moved modestly higher in light of lower interest rates and limited inventory. 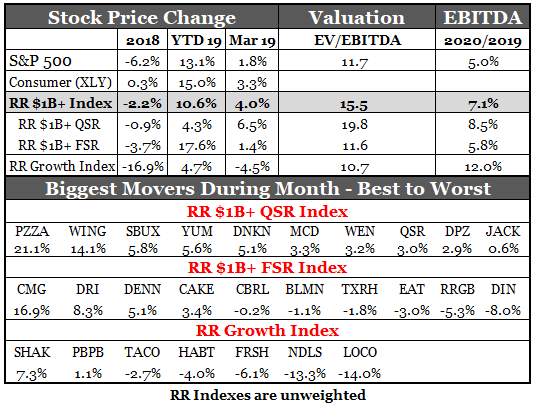 RR $1B+ Chain Index out-performed the S&P 500 for the 2nd consecutive month, led by a QSR rebound. Papa John's 21% increase reflected: the appointment of Shaq O'Neal to its board; a new CMO; and Starboard Value's 9.99% investment stake. Cap rates declined in March, following the 10-year rate lower. Notably, QSR properties represented the vast majority of Marcus & Millichap's transactions during March. 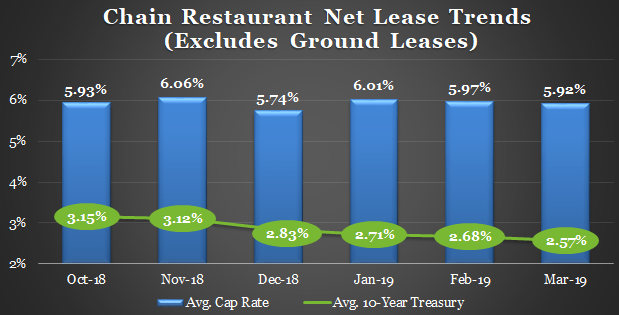 Disclaimer of Liability: Although the information in this report has been obtained from sources Restaurant Research® LLC believes to be reliable, RR does not guarantee its accuracy. The views expressed herein are subject to change without notice and in no case can be considered as an offer or solicitation with regard to the purchase or sales of any securities. Restaurant Research’s analysis and opinions are not a guarantee of the future performance of any company or individual franchisee. RR disclaims all liability for any misstatements or omissions that occur in the publication of this report. In making this report available, no client, advisory, fiduciary or professional relationship is implied or established. This report is intended to provide an overview of the restaurant industry, but cannot be used as a substitute for independent investigations and sound business judgment. Sponsors are not responsible for Restaurant Research's data and opinions. Copyright 2019.